For those other lovers of rock climbing, this book is a must read! However, for readers who enjoy stories of adventure and uncertainty paired with detailed moments of heart-stopping fear, this book is also for you. 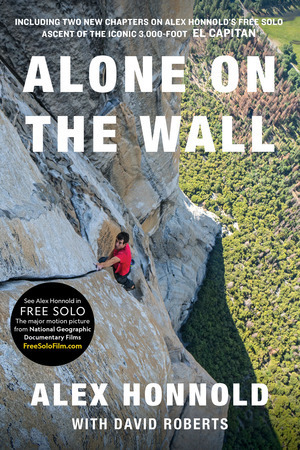 Alone on the Wall shares detailed stories of many of Honnold's escapades with readers. He's climbed all over the world, literally. From Patagonia to Europe to Africa. The stories that accompany these climbs are intense and, as my husband says, make your palms sweat just reading it. Though I didn't feel any sweaty palms while reading, I definitely had to keep telling myself that Alex Honnold is still alive. Important information to know is that the type of climbing he does, free soloing, is climbing without ANY protective gear. That is NOT the type of climbing that I enjoy. I go for toprope and sport any day, but even thinking about free soloing something that means life or death with each movement is not for me. Reading about it though... now that's something I can get behind. The book spans several years of Honnold's climbing adventures and even throws in a bit of a love story. One thing that bothered me a little bit was that, at some points, Honnold seems so arrogant it's nearly annoying. However, everyone that makes a quote in the book mentions that he's so down to earth. I can't really imagine that as I struggle with these two conflicting mental images. I'll have to take everyone's word for it as they know him and I, obviously, do not. Regardless, this collection of adventures is definitely a book that rock climbers and non-climbers will enjoy. It's absolutely mind-blowing to imagine that someone has accomplished all of these fantastic feats. And the descriptions are so detailed that you can even picture yourself there, not that all readers would want to (too scary!). And, if you want to be able to actually see it (at least the climb of El Cap) --- you can! They made a movie during his climb, which is on my to-see list. Though, watch at your own risk, I've heard it's the most intense climbing movie so far.